First, I would like to thank you for your interest in me. Your confidence in my abilities is very encouraging. I look forward to contribute into the success of your organization and be a valuable member of your professional team. Having said that, I can’t help but point out my disappointment from the salary and benefits offered to me. I had something else in mind and I feel I should share it with you since we were both open from the start. I wouldn't have discussed this matter with you hadn't I anticipated a tolerating and understanding person like yourself. I think it would be only fair if my pay would project my level of experience and extensive skills. I’m sure you agree with me on this point. I am aware of the market’s standard for someone in my level and I believe that your offer is slightly less than that. My enthusiasm and commitment are your guarantee for quality work that will exceed your expectation. I want to give one hundred percent of my abilities, but it would be much easier if I’m one hundred percent satisfied with the compensation. It’s a win-win situation for both us. I am confident that you appreciate my argument and I kindly ask you to reconsider your offer. Thank you very much for your job offer. I very much the opportunity to work for your esteemed company, but I can’t help but express my disappointment with the benefits package. Looking back at my education and level of experience, you can easily see that I am over qualified for this position, and the fact that you have selected me is a clear indication that I’m the right person for the job. [List here additional qualifications and past achievements to support your case]. I would like to stress out again my interest in the job, but I really think that we need to clear out this point first. I kindly request from you to reconsider your proposal taking into account the arguments presented above. I am sure we can work something out. I am delighted that that you offered me the position of [….] and I can assure to you that your choice was optimal. I look forward to working with you but I’m a little bit disappointment with the salary offered to me. Honestly, I was expecting a higher figure. There is so much that I can offer beyond the outlined scope of the job. With my pace, dedication, and commitment to best standards, productivity and high quality work are both guaranteed. I trust that you agree with me that employees should be compensated according to their contribution, hence I kindly request from you to reevaluate my qualities and input, then adjust your offer accordingly. I am very serious about this job and I am sure we can reach an equally satisfactory agreement. I was very excited to receive your job offer. I thank you for your trust in my abilities, which I can’t wait to exploit in the best interest of your organization. 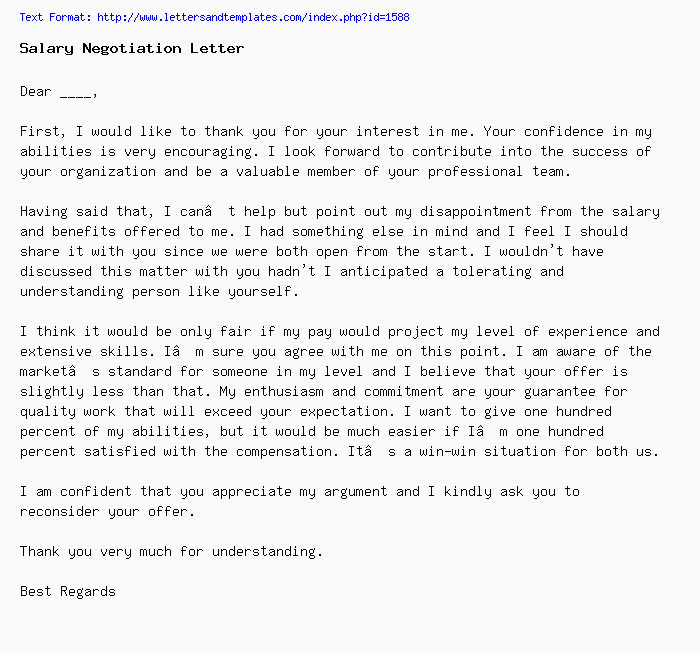 As I was going through your offer, I couldn’t help but notice that the salary offered to me is lower than I was expecting. I honestly think I deserve more considering the savings I will bring into your production costs. These savings will totally eclipse any amount you will ever pay me. This fact alone merits a reconsideration of my salary, not to mention my qualifications and level of experience. I am very interested in this opportunity, but it is very important that we are both comfortable with all the terms. I trust your judgment and look forward for years of fruitful cooperation. I would like to thank you for your job offer. I have always been looking for a position where I can exploit my abilities and reach into my potential. The discussions we had during the interviews were very interesting and enlightening. Having said that, the salary that you offered me doesn’t quite scale into my responsibilities and to my expected contribution. I think I deserve more given the increase in [sales/production/profits] I will be introducing. These increases will totally eclipse any amount you will ever pay me. This fact alone merits a reconsideration of my salary, not to mention my qualifications and level of experience. My interest in this post cannot be overemphasized, but it’s important that we all start off at the right foot. I kindly ask you to reconsider your proposal in way that gives more credit to my experience and my contribution to the success of your organization. Thank you very much for your job offer. I’m more than willing to accept your offer and its inclusive terms but first I would like to request a modification to the point pertaining to my salary. Obviously you think I’m the best person for this role and I can assure you that your decision is correct, but I think that the offered salary doesn’t scale well to my  years of experience and extensive knowledge. I am confident that I will be an asset to your team and that I will bring immediate improvements to this company. Based on that, I kindly ask you to rephrase that section of the offer so that it matches my qualifications and extensive expertise. I am very interested in this role and I really want to us to reach an agreement. I trust your judgment and I’m confident in your ability to maintain a fair compensation system. Looking forward to working with you. I am thrilled with your offer for the position of […] at your esteemed company. This decision encompasses a great deal of trust in my abilities and qualifications. This feeling of honor and pride remains unfortunately incomplete due to a minor unsettling matter. The salary you offered me falls a little short to my expectations. I think with my extensive experience and vast exposure to all disciplines in the industry puts me in a position to immediately induce a positive impact at your organization. I’m very well aware that compensation is granted based on performance and relative contribution. In this context and due to my confidence in my abilities, I kindly ask you to modify the contract to include a salary raise of [10%] at the end of my [six months] probation period. I have strong faith in my skills and I am 100% sure that you will happily grant me that raise based on my results.